Welcome to Berning Construction, providers of affordable, high quality new home construction and remodeling. In business since 1999, Berning Construction offers quality work that you won’t find with just any general contractor in the Des Moines area. We take pride in our customer’s satisfaction with every project we complete. Through one-on-one customer service, a responsive, timely crew, and affordable prices, building your next home will be a lot less stressful. Having the owner on-site, and involved in every project is important to us, and is just another measure we take to make sure nothing about your new home is overlooked. 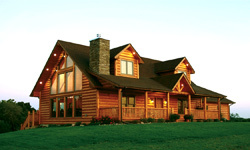 We specialize in building log, regular residential, and timber frame homes as well as home remodeling to South West Iowa and South Central Iowa including Osceola, Des Moines, Winterset, Indianola, Creston and Chariton, Iowa. We have also been known to stretch our services to include Minnesota, Nebraska, and Missouri, so take some time to view our site, and let us show you what we’re all about. Call 641.414.9131 or Click for Timber Frame Homes.